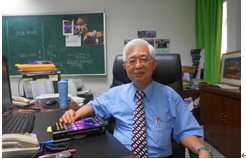 Tutorial Lectures: Gwo-Hshiung Tzeng ——"New Concepts and Trends in the MCDM Field for Solving Actual Problems - New Hybrid MCDM Model"
"New Concepts and Trends in the MCDM Field for Solving Actual Problems - New Hybrid MCDM Model"
How trends in future prospects? Which problems will be improved for satisfying the users'/customers'/social needs in marketing situations and how overall considering problems in dimensions and criteria can be achieved the aspiration levels? However, we find that the traditional MCDM field ignored some important new concepts and trends, needed some assumptions limit/defects to solve actual real-world problems. Therefore in our researches some new concepts and trends in the MCDM field for solving actual problems have been proposed as follows. First, the traditional model assumes that the criteria in value-created are independent and hierarchical in structure; however, criteria are often interdependent in real-world problems; because "Statistics and Economics are unrealistic in the real world", so DEMATEL technique can be used to find the interrelationship matrix and build a influential network relation map (INRM) for solving the relationship problems in the real world. Second, the relative good solution from the existing alternatives is replaced by the aspiration levels to avoid "Choose the best among inferior choices/alternatives", i.e., avoid "Pick the best apple among a barrel of rotten apples". Third, the emphasis in the field has shifted from ranking and selection when determining the most preferable approaches to performance improvement of existing methods based on INRM, because "we need a systematic approach to problem-solving; instead of addressing the systems of the problem, we need to identify the sources of the problem". Fourth, information fusion/aggregation such as fuzzy integrals, basically, a non-additive/super-additive model, has been developed to aggregate the performances. Therefore, in order to overcome the defects of conventional MADM method, we have focused on developing a series of new Hybrid Dynamic Multiple Criteria Decision Making (HDMADM) method for solving the complication dynamic problems in real world and applying to improve the real issues in the trends and prospects. Finally some empirical real cases are illustrated to demonstrate effectiveness of the proposed new hybrid MADM methods. From those real cases, the best performance improvement strategies can be devised to provide the most suitable/reasonable effective and efficient strategies for improving the gaps to reach the aspiration level. Fifth, we proposed a new thinking of MODM models with changeable spaces to help the decision-makers for win-win planning/designing to achieve the aspiration level, which is better than to achieve the ideal point or Pareto optimal solutions. Tutorial 2013 Joint Rough Set Symposium (JRS 2013), Halifax, Nova Scotia, October 10-13, 2013. The 2013 Joint Rough Set Symposium (JRS 2013) encapsulates the 14th International Conference on Rough Sets, Fuzzy Sets, Data Mining and Granular Computing (RSFDGrC 2013) and the 8th International Conference on Rough Sets and Knowledge Technology (RSKT 2013). It will also host the workshops on Rough Set Theory (RST 2013) and Rough Set Applications (RSA 2013). Your article entitled “Compromise solution by MCDM methods: A comparative analysis of VIKOR and TOPSIS (Authors: Opricovic, S; Tzeng, GH) as published in the “EUROPEAN JOURNAL OF OPERATIONAL RESEARCH” on July 16th, 156(2), 445-455, 2004 has been recently identified by Thomson Reuters’ Essential Science IndicatorsSM to be one of the most cited papers in the field of Economics and Business. Author(s): Tzeng, G. H.; Lin, C. W.; Opricovic, S.
Author(s): Chen, M. F.; Tzeng, G. H.
Author(s): Ong, C. S.; Huang, J. J.; TZENG, G.H. Source: Expert Systems With Applications, Volume 29, Issue 1, July 2005, Pages 41-47. Author(s): Opricovic, S.; Tzeng, G. H.
Author(s): WU, CH; TZENG, GH; GOO, YJ; et al. Author(s): Tsaur, S. H.; Tzeng, G. H.; Wang, K. C.
Author(s): Liou, J. J. H.; Tzeng, G. H.; Chang, H. C.
Author(s): Huang, C. Y.; Shyu, J. 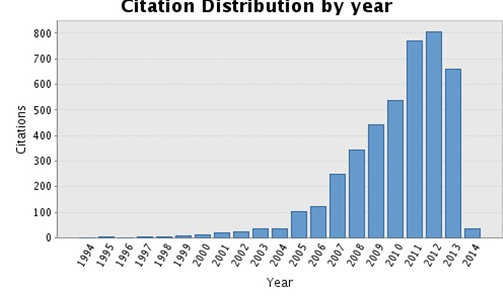 Z.; Tzeng, G. H.
Author(s): Huang, J. J.; Tzeng, G. H.; Ong, C. S.
This graph shows the number of times the articles on the publication list have been cited in each of the last 20 years. Note: Only articles from Web of Science with citation data are included in the calculations. More information about these data.